1,800 agencies – Providing guidance and access to Census data. Census State Data Centers are statistical agencies, state demographers, and data-providing organizations from 56 states and U.S. territories. We partner with Census Bureau’s headquarters and its Regional Offices to provide expert analysis, training, and extension of Census products and data in our respective states. A memorandum of agreement between the Bureau and the states and territories defines the partnership. 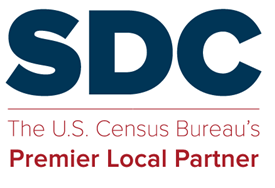 Since 1978, SDC member agencies and affiliates have provided millions of data users with access to Census Bureau data and related population resources. This significant support is provided by the network’s dedicated local professionals in their roles as economic developers, librarians, demographers, and research professionals. This website serves our SDC member agencies by providing resources, information, and links that aid our partnership. This website is maintained by SDC member volunteers, with governance from the SDC Steering Committee. This website receives no federal funding. To contact our webteam, regarding this website, use the contact form here. What’s new on the SDC Clearinghouse website? What’s new on the SDC Clearinghouse website? You tell us! Please take a couple minutes to share a new product or resource from your State Data Center. (Lead, coord, and affiliate members are all welcome.) Your new product can be an interactive data query tool, a data dashboard, a collection of area profiles, a presentation, or a traditional report. We’re looking for great examples of these — examples that are published to the web, and that provide a model for peer states. When you submit the name and URL link of your product, it will appear as a new item in the wordpress database at SDCClearinghouse.com. Some products and resources fit more than one category. So fill out the form today! We will share your good works. This website is maintained by SDC member volunteers, with governance from the SDC Steering Committee. This website receives no federal funding. Web domain registration and WordPress subscription costs this year are generously sponsored by the Tennessee State Data Center at UT Knoxville.